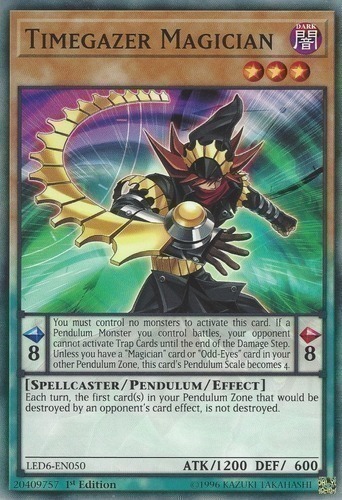 Text Pendulum Effect: You must control no monsters to activate this card. If a Pendulum Monster you control battles, your opponent cannot activate Trap Cards until the end of the Damage Step. Unless you have a "Magician" card or "Odd-Eyes" card in your other Pendulum Zone, this card's Pendulum Scale becomes 4. Monster Effect: Each turn, the first card(s) in your Pendulum Zone that would be destroyed by an opponent's card effect, is not destroyed.